Thank you for the information about the process. This was my first time to help someone with a grant request. I can't express how grateful [my patient] and her family were when they heard you would be able to provide your grant to her. Your grant will help her with her rent and she can recuperate without worry about her expenses. Also, you have been so helpful to all the donors that I refer to you especially since most of them come from the Bronx and have limited incomes. It makes their donating more manageable and stress free. Thank you all so much for your help. I would like to write to tell you how appreciative I am of the help I received from your organization for one of my patients. I personally had contacted about seven agencies including the manufacturer to see if I could get assistance with Cody'a co-pays, which were in excess of $1,700 for a three month supply through his commercial insurer. Cody, himself, had contacted three to five agencies and had had several conversations with his insurance company regarding his limited income and this large co-payment. We were unable to get any assistance until we contacted the American Transplant Foundation. We are so appreciative of the ease of completing the application and the positive response we received from the staff. Thank you, and thank the staff for your generous and timely donation. Thank you so much for all of your work with our donors. The assistance you provided often helps alleviate the financial stressors they experience during their surgery and recovery period. So often they are willing to help a family member even when it causes them hardship. You have given our donors a reason to smile and feel comfortable knowing some of their expenses may be covered. Again, thank you for all that you do to help this special group of people. The American Transplant Foundation was extremely helpful in assisting my patient with payment for a premium which had prohibited him from accessing his immunosuppression medications. Their application was easy to access and file, and they quickly approved my patient and provided the requested grant. In such a difficult economic climate, I am very grateful to have this grant to recommend to my patients in need. Over the years, I've had many potential living donors ask if there was any assistance with their routine monthly expenses while they recuperate. I've always had to be the bearer of bad news and tell them, "no." That is, until I recently learned of ATF! I've made several referrals to this organization and they generously have supported these donors with financial assistance. This enables the donors to focus their energy on their surgery, recovery , and the recipient as opposed to worrying if the electricity bill will be paid. The staff has been very helpful to me-- calling to clarify something, explaining terminology-- as I navigated my way through the referral process! When my patient, Patrick, received his heart transplant last year he had coverage for his immune suppression medications, but no other drug coverage through his Medicare Advantage plan. He was enrolled in several patient assistance programs and obtained his most expensive medications through drug manufacturers but these were stop-gap measures. He needed a long-term insurance plan. He ultimately qualified for MAWD (Medical Assistance for Workers with Disabilities) and received Pennsylvania Medicaid. His local county office initially enrolled him in the wrong medical assistance product with no drug coverage. At that time, he was forced to choose paying for his medications over paying the monthly insurance premiums to maintain his insurance. Thanks to a grant from the American Transplant Foundation, Mr. Henderson was able to pay the backed premiums. When his county ultimately enrolled him in the right insurance product with drug coverage, Mr. Henderson was able to take over the monthly payments himself with no interruption of his coverage. 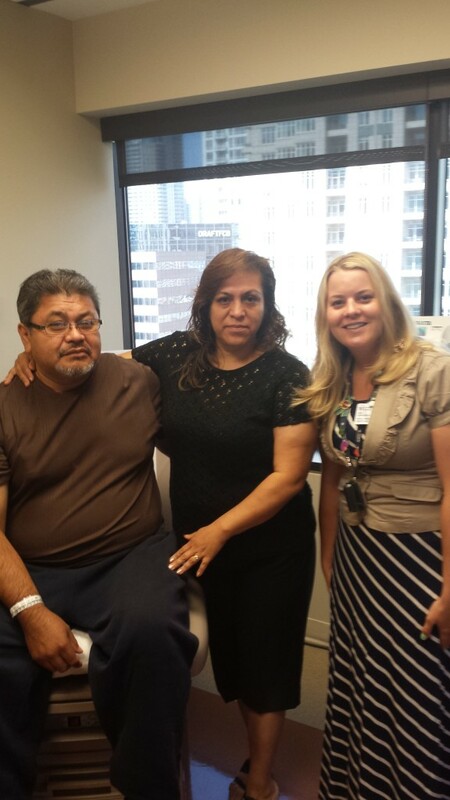 Teresa became a living kidney donor for her wonderful husband on July 26th. The family has been through a tremendously hard year with the loss of their son, but Teresa was extremely motivated to become a living donor for her husband to create a better life for him. "They are both doing very well after their living donor kidney transplant. Teresa is ready to return to work as soon as she is able to. They express much appreciation for the ATF assistance they received. Without the assistance, it would’ve been very difficult for this donation to occur. The assistance also alleviated much stress and enabled the family to focus on the recovery." I recently made a grant request for a patient who was unable to make his Medicare premium payment because he was in the recovery period following kidney transplant and had not returned to work. Prior to transplant he was a hardworking individual who pursued kidney transplant as the best way to continue working to support his family and remain a productive member of society. Unfortunately, his leave from work was unpaid and he lacked the funds for his quarterly Medicare premium payment. His request for help from the ATF was granted, but, he had borrowed money to make his premium payment by the due date. I was very impressed that the ATF took the time and effort to speak with him directly to determine if there were other outstanding bills with which they could help. The American Transplant Foundation subsequently made his house payment. I fully expect that he will return to work soon, but the American Transplant Foundation’s help was critical in helping this individual maintain his house and insurance coverage until then. I'm writing to express my gratitude for the assistance provided to my patient, Alicia. She had planned to donate her kidney to her son, even though her husband, who is not the recipient's father opposed it. His opposition was so strong that they split up before the surgery, leaving her with only her income to rely upon. She was undeterred and kept moving forward with the donation. Then she heard that she was not eligible for state disability support during her recuperation. Her job is very physical and she didn't have enough money saved up to cover her expenses during the six weeks of recuperation needed. With just days to go before the surgery, she did not know what to do. I suggested that we contact American Transplant Foundation. I told her that ATF is the only agency I know of that could possibly assist with such short notice, but that this was very short even for them. She knew she could cancel the surgery if the financial consequences were too great. I began the application on Tuesday and was told she was approved by Wednesday! She was able to go to surgery Friday relieved that she had this financial assistance. Thank you so much for assisting her so quickly! Thank you so much to all of you who work so hard to raise the funds to help these potential donors and their recipients. Your assistance has helped several of our donors, but the assistance you are providing for our most recent patient is particularly remarkable. This potential donor is a man in his 20’s who serves in the National Guard and has been deployed to Iraq two times. While he was deployed, his wife received tremendous support from her best friend and her best friend’s family. When this patient learned recently that his wife’s best friend’s 12-year-old son needs a kidney transplant, he immediately offered to try to help the child. The patient then passed all of his medical testing, but the only thing standing in the way of him being able to donate was his financial situation. The patient has two small children of his own and is the sole income earner. He was employed but did not have paid leave from his job for the 4 to 6 weeks of recovery. The patient applied to the ATF for assistance with his rent and utilities, stating that if he could just ensure that those bills would be covered then he would be able to donate. He was thrilled when he received the news that he was approved for assistance and quickly scheduled a surgery for August. However, two days ago - 22 days from the scheduled surgery – he was let go from his job. The patient worried that he would no longer be able to donate. He asked to appeal to ATF to see if you all would still provide assistance even though he does not have employment right now. He was ecstatic when he learned that you all agreed to continue to approve his assistance. He stated that the donation was really hinging on this assistance. Your assistance has truly made this donation and transplant to a 12-year-old child possible! Thank you again for all you do to help these patients! I want to take this opportunity to thank you and your wonderful agency for assisting my recent kidney donor. Without your support she would not have been able to donate her kidney to her friend. She works as a car mechanic, a very interesting but very physical job for a female. Due to the surgery, she needed to be off of her job for at least 6-8 weeks. Your agency paid her rent and utilities, so she could take the time off and pay her expenses, in order to donate her kidney. She and the recipient are only in their 20's. The recipient would have had to spend years on dialysis, which is very stressful on the body, before getting a transplant. Due to the donation he is already back at work and living a productive life. This was all possible because of your agency's generous contribution. Keep up the great work that you do. You are really making a positive change in the lives of so many people. It is with much thanks and appreciation that I write to you regarding my patient, MSA for the financial assistance you provided toward on-going medical expenses related to liver transplantation. Mrs. A is on the needs program through Social Security that provides a $200.00 monthly income. Her husband works with a less than a $2,000 total monthly household income. They were able to meet their essential expenses if he was able to receive overtime work. His job has not been able to offer overtime and they have gotten behind on monthly bills since her transplant related expenses have been $340.00 per month. She was not eligible for co-pay assistance programs since she does not require brand name medications. Without the assistance of the American Transplant Foundation, my patient would be in financial and medical jeopardy. Much thanks and appreciation to all of you for what you do on the behalf of transplant patients! I am very thankful and appreciative of the support that the patient assistance program has recently offered to two of my patient’s. The first gentleman that they offered a grant to received his kidney transplant in December of 2010 was having difficulty accessing his immunosuppressant medications for his kidney transplant due to termination of his Medicare Part B premium due to non-payment. He was off work for several months due to transplant related issues in early 2013 and was unable to make his quarterly premium payments due to his loss of income while off work. Due to coordination of benefit issues with his secondary insurance, our pharmacy was unable to bill these medications through insurance at all and he had to make payment arrangements to access these medications in the retail pharmacy. He was denied assistance through the pharmaceutical company based on his secondary plan and issues with his Part B termination. We are now working to apply him for long-term assistance with these premiums through the HealthWell Foundation to help avoid any future issues managing these premiums now that Part B is covering these medications again. First, I would like to thank you for your financial assistance you have provided our living kidney donors in the past and those that you will help in the future. I would like to share with you some information about the living donor you provided assistance to this week. I would like to share with you some information about the living donor you provided assistance to this week. The donors name is Abram and he was able to donate to his younger brother, Jacob, on May of 2013. Abram was one of the most dedicated donors I have had the pleasure of working with. He went above and beyond to improve his health by losing a significant amount of weight and quit smoking in order to be an eligible donor for his brother who had been on our kidney waiting list since 2010. Like several of our patients, Abram has some financial troubles and is providing for his wife and their six children. I applied for this grant for him with hope that he would be approved. I was very impressed with how quickly he was approved and was glad to see the relief in his eyes as I told him he would be receiving $1,000 toward his mortgage after the donation surgery. This grant will pay for three mortgage payments for his family. Abram is very appreciative and expressed to me several times how the money will help him and his family and will allow him to comfortably recover without having the worries of returning to work before he is ready. The Jones brothers are both recovering well and have not had any complications. Again, I want to thank Jenny who was very helpful and quick to respond with the application process and the foundation for what they do to help our donors. I am here to tell you that they were a GREAT help to my patient! A post transplant patient made an initial call to me on 2/14 about receiving assistance for her overdue Medicare premium. My patient is on a fixed income and receives long-term disability. She hopes to return to working full-time soon. The following week I returned to work with the info about this foundation on my desk. I had forgotten all about this until I began to read the one-page form. I completed and emailed the application, sent the reps the requested info that I obtained from my patient, and as of today my patient was approved for assistance! The Foundation is mailing a check for $500 (maximum for recipients) asap. I love days like this! Timothy received a kidney transplant in 1998. He has been doing well for many years until he ran into financial difficulties related to expensive medication bills and insurance premiums. American Transplant Foundation was able to provide Timothy with a financial grant to help him afford his life saving transplant medications. With the help of ATF, Timothy was able to overcome his financial struggle and continues to do well while working towards his graduate degree. When I first met Frances she could not emphasize enough just how much she loved her work; she cares for the elderly for a living. Her compassionate and caring nature did not stop there, it transcended her professional life. When Frances learned one of her dearest friends was experiencing renal failure and was in need of a kidney transplant her desire to help by becoming their kidney donor was very apparent and undeniable. Frances managed on a limited income. She had some paid time off set aside, but unfortunately this would not have been sufficient for her entire recovery; she would have experienced lost wages as a result. The American Transplant Foundation supported Frances in her effort to maintain her financial obligations post transplant, which in turned allowed for a much less stressful recovery. Frances and I are deeply grateful for the financial assistance the Foundation provided during this difficult time. The American Transplant Foundation has always been incredibly responsive and attentive to the unique needs of our patients. Thank you for all that you do to help these amazing people be able to give with their hearts! Leslie wanted so badly to be a living kidney donor to her father. In my first meeting with her, her determination was evident. As part of her social work evaluation we look for risk factors, issues that can get in the way of her being a viable candidate. One of the issues that presented was her lack of health insurance. Knowing that a person is able to take better care of themselves before and after organ donation if they have health insurance, we worked together toward this goal. Leslie, a single mother of two children, lives off a limited income. Purchasing health insurance brought a new large monthly expense into her life. During her recovery, Leslie would be unable to work and would experience lost wages as a result. The American Transplant Foundation supported Leslie in her effort to maintain her insurance post transplant. Leslie and I are deeply grateful for the financial assistance the Foundation provided during this difficult time. Also, what cannot go left unsaid is that American Transplant Organization was both professional and kind. A most lovely combination! I can’t thank the American Transplant Foundation enough for their recent assistance. As a social worker, I have many different resources to pull from when a patient has a crisis and my job is to utilize those resources and work with the patient to come up with a plan to solve whatever problem has arisen. However, recently I had a patient that was not eligible for any of the programs that I usually turn to and was very close to losing his kidney transplant. This patient had a kidney transplant at the beginning of the year and due to several complications with the transplant, was out of work much longer than expected. Without any income, he was unable to make his insurance premium payments and did not have any family members that could help him financially. After a few months, his insurance was terminated and he was unable to obtain his anti-rejection medications. This patient worked throughout the time he was on dialysis and went back to work as soon as he could after the transplant. Despite having insurance, his medication copays are about $300/month, in addition to his monthly insurance premiums. Although these costs are difficult for him, working at a minimum wage job, he has made his transplant a priority. However, he got in a bind and resources were almost non-existent. The American Transplant Foundation was so responsive and caring and they were able to bridge the gap during his emergency, which resulted in the patient being able to reinstate his insurance, continue on his anti-rejection medications, and keep his transplant.